I use a gxt file editor and open the English.gxt of the vcs iso file,but when I type Chinese it will display mojibake.The game and the program don't support Chinese,I guess I need to change the font file.To be honest,I'm a newbie,and I know nothing about this.Anyone knows?And my English isn't good,I hope you can understand what I said. try to look a japan game version. it should have extended "repertoire". for example, Vice City NTSC-J (PS2) character set was hugely extended (see the screen below). it should be enough, i think ^_^. i never played VCS Japan, i've only seen the screens on japan forums. but i guess PSP versions have a same character set. for example, Vice City NTSC-J (PS2) character set was hugely extended (see the screen below). it should be enough, i think . If you get somewhere Japaneese version of VCS and provide me game.dtz file from game *.iso, I can help you get fonts, edit them and text. Also, if you need to translate some in-game textures, you are welcome, it is not a problem. If you get somewhere Japanese version of VCS and provide me game.dtz file from game *.iso, I can help you get fonts, edit them and text. Also, if you need to translate some in-game textures, you are welcome, it is not a problem. Wow,I'm really grateful for your help!It will help a lot though I don't want to modify a Japanese version.I got the file,how shall I send it to you? As for textures,I don't know if they need translating.Maybe I only deal with text,but thanks. So, did you get game.dtz from Japanese version? This is important, because only it has advanced character set. You may upload it to any hosting you wish (rapidshare/mediafire/etc) and publish link here. Ok, thanks, looking through. Already found usual fonts, only two of them (fancytext, bigtext) are there and zlib-packed as usual, so last one (gametext - with advanced character set) is separate. All other textures (hud, etc) are just the same as in US/EU version. Please, could you upload gta3ps2.img? Yes, it is very large, but I was very surprised that textures "FSFontsJP1" and "FSFontsJP2" are in table of files which are in this archive. Ok, thanks, looking through. Already found usual fonts, only two of them (fancytext, bigtext) are there and zlib-packed as usual, so last one (gametext - with advanced character set) is separate. All other textures (hud, etc) are just the same as in US/EU version. Please, could you upload gta3ps2.img? Yes, it is very large, but I was very surprised that textures "FSFontsJP1" and "FSFontsJP2" are in table of files which are in this archive. Excuse me,shall I guess you mean the character set is in game.dtz?And how do you open it? 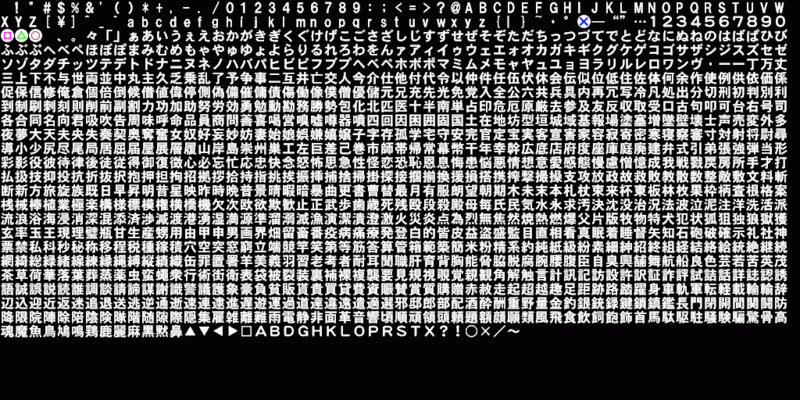 In Japanese version of game.dtz there is a "font file" with only two game font textures ("fancytext" and "bigtext") while usual US/EU version contains three ones ("fancytext", "bigtext" and "gametext). So, this "third" texture has advanced character set and stored separately in Japanese version, not in game.dtz as usual (I searched through this file and found nothing except textures which are just the same as US/EU ones). "FSFontsJP1.xtx" and "FSFontsJP2.xtx" are in special "font" folder? Well, nice, I just thought than R* put them into *.img archive. Their filenames were at the end of *.img content table... I am sorry that misinformed you, so we need this two files, not *.img archive (hope it was not so hard for you uploading it). It doesn't matter.But there is no "FSFontsJP2.xtx" but only "FSFontsJP1.xtx",I don't know why. Well, I understood. Your files are from PSP version. PS2 version has one more (extra) font - "pagertext", while on PSP for pager is used usual "gametext". So, there is no "FSFontsJP2.xtx" on PSP. Other fonts on Japaneese version are just the same as in EU/US, with English alphabet. So, do you need to replace some characters, or this set is enough? This font texture is used for subtittles, in menu, etc. You should check Japaneese *.gxt file if there some strings (like names of areas, car brands and radio stations names) are stored in English. But I still want to study an American version.As far as I know,someone has made Chinese localization patch for Japanese version,but most people aren't content with it.To achieve it,I guess we needn't change the original font file in US version,just make game load the designated file as JP version instead.What do you think about that? In any case you will need game.dtz, *.gxt, FSFontsJP2.xtx and EBOOT/BOOT executable files from Japaneese version. Unfortunately, I can not say anything for sure about any other files, but theese ones are necessary. In fact, they will "make JP-version" from your US-version, while *.iso code will be stored. But anyway, why would you like to stick on the US version, not JP one? In any case you will need game.dtz, *.gxt, FSFontsJP2.xtx and EBOOT/BOOT executable files from Japaneese version. Unfortunately, I can not say anything for sure about any other files, but theese ones are necessary. In fact, they will "make JP-version" from your US-version, while *.iso code will be stored. But anyway, why would you like to stick on the US version, not JP one? Whatever you say,thank you for real.I want to have the skill like you one day,too.Anytime I can help you,just let me know. Not at all, I did practically nothing). But anyway understood you. If you want to change someone's opinion, maybe you should do something extraordinary, show interesting developments. For example, why not to translate Vice City textures to Chineese? (and use US version as "base" of course) "City" textures (in-game world - plates, signboards, posters) or "game interface" (menu, radar, etc.) ones? I can describe some technical parts of working process, what soft will be required and how to use it. Sure if you need. And also have you already figured out how to edit DBCS (unicode) *.gxt? Not at all, I did practically nothing). But anyway understood you. If you want to change someone's opinion, maybe you should do something extraordinary, show interesting developments. For example, why not to translate Vice City textures to Chineese? (and use US version as "base" of course) "City" textures (in-game world - plates, signboards, posters) or "game interface" (menu, radar, etc.) ones? I can describe some technical parts of working process, what soft will be required and how to use it. Sure if you need. Stupid GFW,I can't open gtamodding until today. Well,you're right.I'm using GTA Stories Texture Explorer.I didn't know the author is you when I downloaded it.A quite useful tool.If I get problems I can ask you then. And also have you already figured out how to edit DBCS (unicode) *.gxt? Not yet,but I'm trying to.There's a soft which is used to import and export psp game text file,I'm going to choose it.